Status: Common regular fall migrant east, fairly common central, uncommon west. Common spring migrant east and south, uncommon north, rare west. Rare casual summer visitor south and east. Common regular winter visitor south and east, rare west. Documentation: Specimen: UNSM ZM7459, 25 Apr 1889 Lincoln, Lancaster Co.
Changes since 2000: Harris’s Sparrows have declined in Nebraska and the Great Plains since the latter part of the 20th Century (COSEWIC 2017) and Harris’s Sparrow is considered a species of special concern in Canada, where it breeds (COSEWIC 2017). An analysis of all Nebraska CBC data shows Harris’s Sparrow numbers declined annually by 7.0% during the years 1980-2014(COSEWIC 2017). 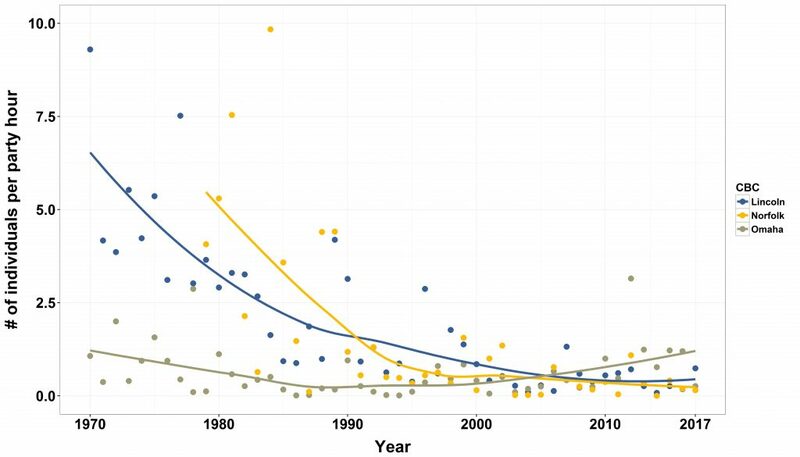 An analysis of three long-running Nebraska CBCs also shows a trend of general decline during the late 20th Century, but also show the declines have stabilized (Figure 1). Figure 1. The number of Harris’s Sparrow recorded per party hour on three long-running CBCs in Nebraska. Points represent reported values and trend line created using locally weighted scatterplot (LOESS) smoothing in R Studio (2015). Data collected by volunteers and provided by National Audubon Society and the Nebraska Ornithologists Union. The Lincoln and Norfolk CBCs experienced sharp declines during the 1970s and 1980s, but numbers have leveled off since the mid-1990s. Results from the Omaha CBC shows a smaller decline in the 1970s and 1980s and a small increase since the 1990s. Early dates above are away from the wintering range in the east and south. There is a gradual movement northward of wintering birds beginning in mid-Feb and increasing gradually through Apr; peak counts in the state are in the first half of May. Migrants pass through Lincoln Co 7-23 May (Tout 1947), although numbers are low that far west. Migrants generally depart by late May but see Summer. High counts: 369 in Pierce Co 8 May 1999, 235 in Lancaster Co 10 May 1996, and 235 in Sarpy Co 11 May 1996. Summer: There are summer (15 Jun-15 Aug) records from Kansas (Thompson et al 2011) and Iowa (Kent and Dinsmore 1996), and a few from Nebraska, presumably of individuals unable to migrate. These are 15 Jun 1975 Clay Co, 23 Jun 2004 Dixon Co, 29 Jun 1970 Adams Co, 9 Jul 1976 Lancaster Co, 20 Jul 1919 a specimen, UNSM ZM7476 Lancaster Co (Mickel and Dawson 1920), 3 Aug 1987 Lincoln Co, and 13 Aug 1975 Adams Co. Although migrants normally arrive in late Sep, there are earlier reports 1 Sep 1990 Buffalo Co, 1 Sep 1990 Holt Co, 4 Sep 1966 Lancaster Co, 6 Sep 1984 Douglas-Sarpy Cos, and 9 Sep 1965 Scotts Bluff Co. Peak numbers occur in late Oct and most birds have passed through by late Nov; wintering is common in the south and east. Tout (1947) gave dates of migration in Lincoln Co 8 Oct-2 Nov.
Harris’s Sparrow is less numerous in spring as a migrant away from wintering areas, and is rare at that time in the northwest (Rosche 1982). Lingle and Hay (1982) indicated that it was uncommon as a spring migrant but common in fall at Mormon Island Crane Meadows in Hall Co.
For later dates away from the south and east, see Winter. Winter: Fall migrants leave by late Nov in the north and west, but good numbers remain in the south and east in Dec, as indicated by CBC data. Wintering is regular in the east and from Platte River Valley counties southward, rarely to Scotts Bluff Co in the Panhandle; Rosche and Johnsgard (1984) listed Harris’s Sparrow as a winter visitor in Keith Co. Wintering may occur in Custer Co based on a few mid-winter reports there. North and west of this wintering range, winter records are rare, especially in the northwest, where Rosche (1982) noted that there are “unusually few observations after late January.” A few wintered at the James Ranch feeders, Sioux Co 1999-2000, and a Mitchell, Scotts Bluff Co yard hosted 1-2 in 2012-2013, one was there 15 Jan 2015, and another on 25 Feb 2017. Additional reports away from the south and east are 10-12 Dec 2009 Custer Co, 20 Dec 1997 Rock Co, 20 on 23 Dec 2011 Antelope Co, 31 Dec 2013 Howard Co, and in Custer Co 1-31 Jan 2014, 2-3 Jan 2010, and 10-23 Jan 2013. Harris’s Sparrow in Papillion, Sarpy Co 5 May 2014. Photo by Phil Swanson. Committee on the Status of Endangered Wildlife in Canada [COSEWIC]. 2017. 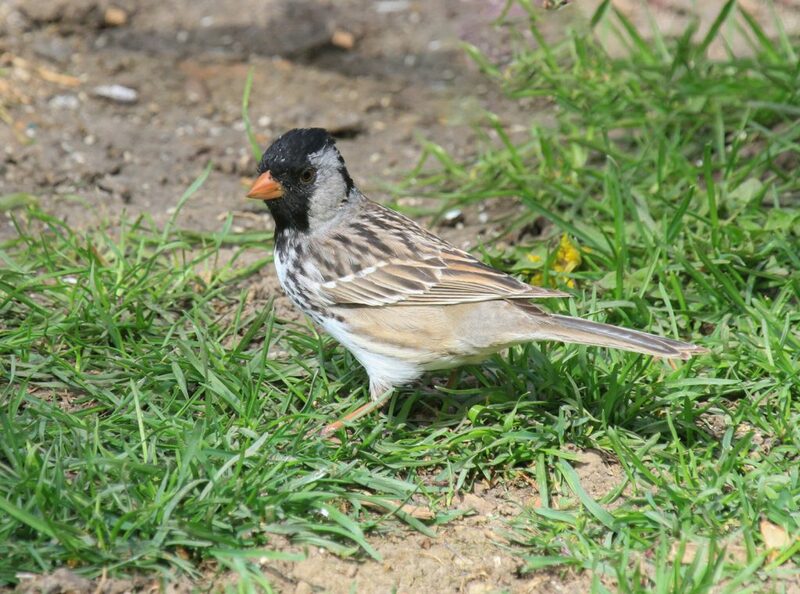 COSEWIC assessment and status report on the Harris’s Sparrow Zonotrichia querula in Canada. Committee on the Status of Endangered Wildlife in Canada, Ottawa, Canada. Lingle, G.R., and M.A. Hay. 1982. A checklist of the birds of Mormon Island Crane Meadows. NBR 50: 27-36.
, Inc. 2015. RStudio: integrated development for R. RStudio, Inc., Boston, Massachusetts. http://www.rstudio.com/, accessed 1 December 2016.